A few weeks ago, we looked at prevented planting acres and its potential impacts on production. This got us to wondering about harvested acres. A few weeks ago, we looked at prevented planting acres and its potential impacts on production. This got us to wondering about harvested acres. Each year, a portion of each crop planted is left unharvested, reducing total production. This week’s post takes a look at the share of planted acres that are harvested for corn, soybeans, and wheat. 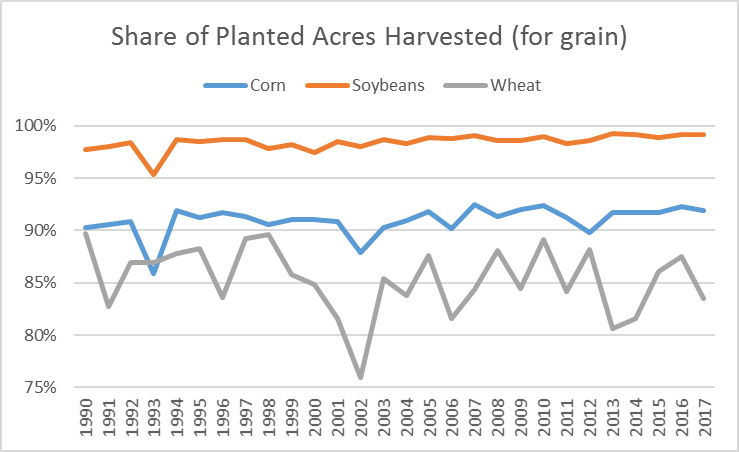 First, the share of planted acres that were harvested (for grain) was calculated since 1990 (shown in figure 1). From these data, a few key observations are immediately obvious. First, the share of planted acres harvested (for grain) varies considerably across the three crops. Soybean have the highest share of harvested acres. From 1990 to 2016, harvested acres were 98.4% of planted acres. Furthermore, the lowest share of acres harvested was 95.4% (1993). Corn has a 27-year average harvested share that is much lower than soybeans, 90.9%. The share harvested for corn ranged from a high of 92.5% (2007) to a low of 85.9% (1993). The overall lower share of harvested acres in corn is not surprising given the use of silage. Harvested acres are typically lowest for wheat. While harvested soybean acres did not fall below 95% since 1990, harvested acres of wheat did not exceeded 90% of planted. The share of harvested wheat acres ranged from a high of 89.7% (1990) to a low of 76.0% (2002). Like corn, wheat often has a viable feedstock alternative as many producers can graze or hay wheat acres. Another possible contributor to wheat’s low share of harvested acres is the low-rainfall (if not nearly arid) regions of the country where wheat is primarily grown (Western Great Plains). Regardless of the cause(s), the share of harvested acres also seems to be more variable from Figure 1. Figure 1. Share of Planted Acres Harvested (for Grain), Corn, Soybeans, Wheat. 1990 to 2017F. Data Source: USDA NASS. There are a couple of ways one could consider the variability of harvested acres, but for this post we simply considered the number of years actual harvested acres were 0.5 percentage points above or below the mean. For example, the average harvested acres for corn is 90.9%, so in Table 1 the percent of time that harvested acres were 91.4% or more (and 90.4% or less) is shown. As one might have guessed from Figure 1, harvested soybean acres are generally much closer to the average than corn and wheat. Harvested soybean acres were 0.5 percentage points below the mean 33% of the time, and 0.5 points above the mean 22% of the time. In total, harvested soybean acres were within +/- 0.5 percentage points of the mean 12 out of 27 years. Corn was more variable than soybeans. Harvest acres were 0.5 points below the mean 37% of the time, and 0.5 points above the mean 41% of the time. Harvested corn acres were within +/- 0.5 percentage points of the mean only 6 of the 27 years. As expected, wheat acres are often more than 0.5 percentage points away from the mean. In fact, wheat is so variable that only 1 year was within +/- 0.5 percentage points of the mean. Table 1. Corn, Soybean, Wheat Harvested Acres Summary Data (1990-2017F). Looking at 2017 data, the USDA’s estimates – which are based on the June Acreage report– have harvested acres for corn and soybeans above the 27 year averages calculated above (Table 1). For corn, the USDA estimate is for harvested acres to be 1 percentage point above the average. With wheat, the USDA estimate have the current 2017 estimate below the 27 year average. For corn and soybeans, this could be important to keep in mind as growing season conditions become more known. While much attention will focus on yield estimates, another path to fewer (or additional) bushels of production could be with a smaller (larger) share of harvested acres. The share of planted acres that are harvested varies across crops. Soybeans have a high share of harvested acres and there is less variability, compared to wheat and corn. For corn and wheat, which have feedstock uses (silage, hay, grazing), the share of harvested acres is considerably lower. For wheat, there is considerably more variation in the share of harvested acres from year to year. While harvested yields are often used to quantify how good (or bad) a year is, it is important to recognize harvested acres can also affect production levels. Going into 2017, the USDA’s estimate for corn and soybean harvested acres are above the average going back to 1990. For regions that have experienced extremely weather conditions in 2017, harvested acres may decline.